MIDORI SCALP BALANCE TONIC (1) 120ML – HAIRDEPOT - Hair & Scalp Care Products, Prevent Hair Loss, Shampoo, Conditioner, Treatment, Styling, Appliances and more! 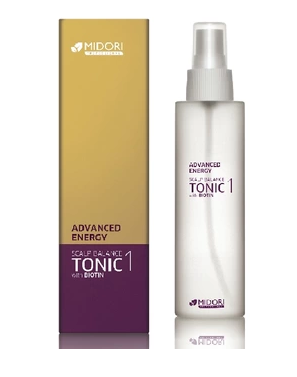 Midori Scalp Balance System 1 Tonic for natural thinning hair. This tonic is a volumizing leave-on treatment for the scalp that contains antioxidants and botanicals that help to provide a refreshed scalp environment. This lightweight, fast-absorbing daily treatment energizes the scalp, anti-greying and promotes hair density. Apply to shampooed and towel dried hair or fully dried hair. Spray tonic directly onto scalp. Gently massage in with the fingertips, rub in with a light circular massage for optimum absorption. Leave on for a 3-5 minutes and styles as usual. DO NOT RINSE. Use daily.